Watching a family of warthogs snuffling and shuffling around in the dirt, down on their “knees” in search of a snack is one of the cutest sights to come across while on a Kruger day tour. Their scientific name is Phacochoerus Africanus, but are known by the name Warthog, because of the four wart-like protuberances on their face. The local South Africans call them a “Vlakvark”, meaning “Pig of the Plains”. Warthogs, immortalised by Hollywood, are amongst the best-loved creatures in the Kruger National Park and they are known for running along with their tails straight up in the air! Warthogs are usually found in family groups and by day you will find them spending their time looking for food. While foraging for food, Warthogs kneel down on their front knees. Female Warthogs weigh between 45 -70 kg while the male Warthog can weigh between 60-100 kg. 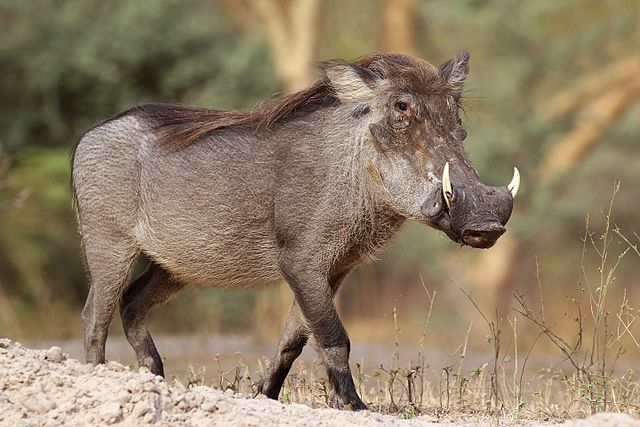 Closely related to the pig family, Warthogs are not the best-looking animal in the Kruger National Park. Warthogs have a sturdy build, large flat heads that appear to have “Warts” on it and four sharp tasks that can reach a length of 25cm. The “warts” are actually made up of bone and cartilage and used to protect the face during fighting. Although Warthogs appear to have no hair on them, at a closer look, you will see they have sparse coarse hairs that are thicker on their backs. Warthogs can go without water for several months during the dry months, but when water is available, Warthogs love to submerge themselves in the water to cool off. They love a mud bath too, as it keeps the insects off their skin and acts as a sunscreen. Having sparse hair makes the Warthog an insect haven and when the mud dries on their skin and drops off, so do the pesky insects. Aiding the Warthog in its war against insects, birds can also be seen riding along on the Warthogs back eating insects as they go along. Despite the fact that Warthogs look ferocious, they are basically placid animals just wanting to go about their business of looking for grass or roots to eat. Warthogs eat mainly vegetation but will scavenge on meat should the opportunity present itself. Adult Warthog are preyed upon by Lions, Leopard, Hyena, Cheetah and crocodiles and when the Warthog is startled or feels threatened, they are surprisingly fast and can run at speed of up to 20km/h. Warthogs live in dens and although they are perfectly capable of burrowing their own, they usually occupy empty Aardvark dens. Their dens are used to raise their young and also as a safe place to escape to when being pursued by predators. When entering a den, mother Warthogs chase their young in first and then usually back in, so that they can use their tusks to guard the entrance. Warthogs can be found in three main groups. Piglets are raised by the females. Male Warthog seldom associates with the females out of mating season. When the females are in season the Warthogs are promiscuous animals and both male and female will mate with several different partners. Females give birth after a gestation period of three months and can have up to eight piglets. In the wild Warthogs live up to 15 years. Although Warthog is not an endangered species, their numbers are on the decline due to illegal hunting and poaching. Ready to visit the Kruger and see this quaint and often feisty little creature? Book your Kruger day tour with Kurt Safari!